The Journal of Geoethical Nanotechnology | Scope and Resolution in Neural Prosthetics and Special Concerns for the Emulation of a Whole Brain, Randal Koene, Ph.D. This article was adapted from a lecture given by Randal Koene, Ph.D. at Terasem Movement, Inc.’s 2nd Annual Workshop on Geoethical Nanotechnology in Lincoln, VT on July 20, 2006. In this article, Dr. Koene explores the relationships, increasing difficulties and ethical concerns associated with three concepts in applied neuroscience: Neural prostheses, whole brain emulation, and mind uploading. the intimate history of life with its perpetual duel with external forces." The three concepts of neural prostheses, whole brain emulation, and mind uploading are related. In this order, they are of increasing difficulty. Neuro-prosthetics is about the replacement of component functions of the central nervous system. Patients today have been implanted with some examples of sensory prosthetics. One example is cochlear implants, which alleviate hearing impairment. Cochlear implants are an example of a prosthetic with a mature development history. During the time of the scientific revolution, Count Alessandro Volta experimented on himself by attaching two metal rods to batteries of his own design and completing a 50-volt circuit by placing the two rods in his ear. As you might expect, he felt an uncomfortable jolt. He also reported hearing a sound reminiscent of bubbling or boiling. In the 1950’s, two French physicians, Djourno and Eyries, performed experiments in hearing augmentation with electrical attachments to the exposed auditory nerve. Then, in 1961, Doctor William House began the era of cochlear implants in earnest by implanting the first patient with a wearable prosthetic. By now, about 100,000 patients have received cochlear implants. The newer implants include processors that reduce background noise and emphasize speech. Cochlear implants also are an example of how ethical disputes can arise with prosthetic applications. For instance, many in the signing deaf community actually rigorously oppose the implantation of congenitally deaf children. They emphasize the unique development of deaf culture and they oppose the classification of congenital deafness as a disability. A second example of sensory prosthetics are retinal prostheses, which are in the advanced stages of testing in several places, such as at the Boston Retinal Implant Project. They involve a combination of external and implanted hardware. There are also different types of present day neural interfaces, such as the implantation of electrodes into the brain for deep brain stimulation, which is a kind of brain pacemaker. This was pioneered by another pair of French researchers, Benabid and Pollak. We use deep brain stimulation to treat movement disorders. Right now, deep brain stimulation is approved or being tested for a variety of conditions, including the treatment of Parkinson’s tremors, primary dystonia (a devastating moving disorder characterized by involuntary muscle contractions), depression, and even Tourette’s Syndrome. If you look to the near future, neural prosthetics will become more complex, replacing functions of entire specialized brain regions. Theodore Berger’s lab at the University of Southern California is working on a prosthetic hippocampus, for instance. Berger’s stated near-term goal is to replace the whole circuit brain dynamics of sub-region CA3 of the hippocampal formation. The CA3 region is considered central to episodic sequence learning. An array of electrodes is placed on each side of a damaged portion of the region CA3, one to record and one to stimulate. A dedicated processor is designed to mimic the electrical input-output relationship recorded in CA3 and applies the necessary computations to signals received from the recording electrodes. It provides useful output to the stimulating electrodes. According to Berger, human trials of the hippocampal prosthetic are slated to begin as early as 2010. 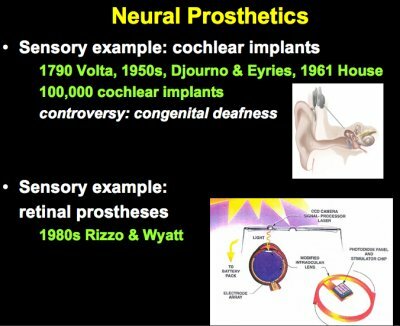 The implementation of neural prostheses is possible both in dedicated hardware and through software. Obviously, medical applications can benefit specifically from the speed and portability of hardware, where as in research it is often useful to be flexible, which is more easily achieved in software applications. 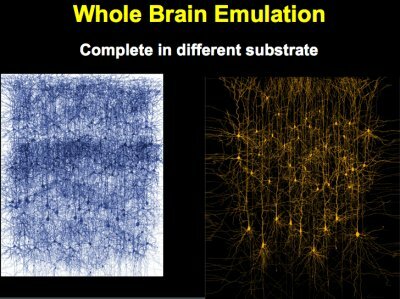 As neural prostheses are gradually able to take over the function of all the different regions of the brain, we reach the next objective - whole brain emulation. This refers to the emulation of the complete brain function on a different and quite possibly, non-biological substrate.